This lunchtime in Milton Keynes shopping centre, and WH Smiths specifically, I got to meet one of my heroes. 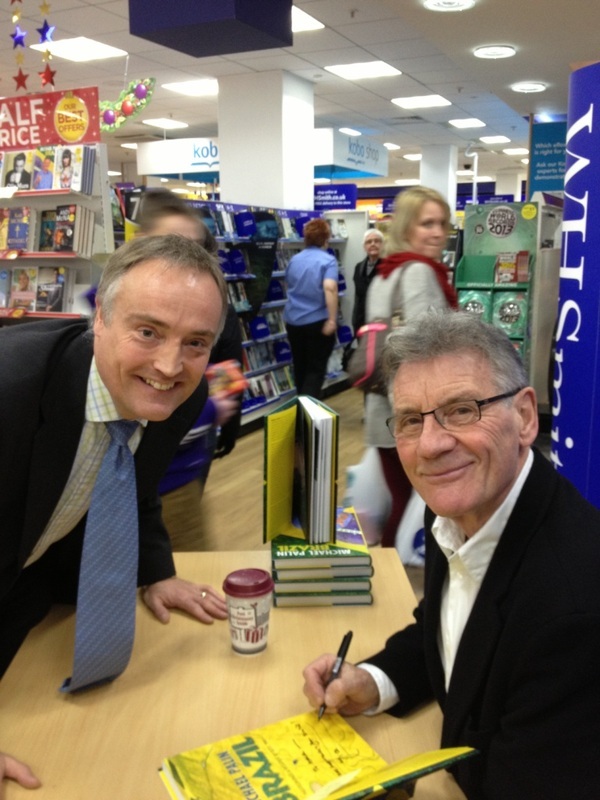 The legendary Michael Palin was in town to do a ‘Brazil’ book signing. Yesterday, whilst out on my lunchtime stroll, I found out that he was due to visit (thanks to a poster in the shop window) and made the decision to try and see him if I could. To my advantage was the fact that the signing was due to start from 12:30pm. I thought that should give me the opportunity to get out of the office, into the shopping centre, join the queue, meet Michael and get back to the office in an hour……………! Cloud cuckoo land did enter my thoughts – the context being that my chances of success could have been as remote as that mythical location (or as far away as Brazil for that matter)! Still I persisted in my self-delusion and today I rushed into town as soon as the eating hour descended. Arriving in the shopping centre, the queue outside WH Smith wasn’t the horrifying spectacle I feared. I joined and crossed my fingers that I’d make it through in time. This queue was a good queue, people chatting amiably, no pushing in and a sense of expectation. All very British! The minutes ticked by and then we were off, the queuing and meeting and signing process was managed with dexterity by Michael’s chaperones and went without hitch. I got to meet Michael, have my book signed, shake his hand and have my picture taken with him. Fantastic – in fact it made my day! I’d love to have had a proper conversation with Sir Palin of Python but practically that wasn’t possible in fact, aside from saying thank you very much, I didn’t get a chance to say very much at all. Watching him interact with those before me in the queue and in the moments that were available to me personally, I came away with the impression that Michael was decent, friendly, polite, approachable, grounded and a thoroughly nice chap. In other words, his off-screen persona was the same as is presented on-screen. He is a man I’d like to invite to my house for dinner with my family or have a beer or a coffee with (Costa not Starbucks) and for me, that is praise indeed. I have watched Michael Palin throughout my life and have many of his videos and books; as a travelling personality and writer, he has the kind of job I could only dream of. I admire him and I am grateful for the chance I had to say hello. I work in a nondescript office in Milton Keynes and let’s be honest; the town isn’t exactly glamorous! But twice in a week now I have managed to have a lunch break that has amazed me - last week an interaction with the FA Cup and this week a handshake with Michael Palin. Brilliant! And Michael, if you ever read this – thank you for all the years of entertainment and thank you for making some time for me. And, if you are ever brave enough to venture into far flung, deepest, darkest Daventry, you’re welcome at the Baldwin home! Oh and readers, just in case you are wondering, I made it back to the office just inside of the hour. Perfect!